This time, we’re looking at the story behind the Mega Man story. 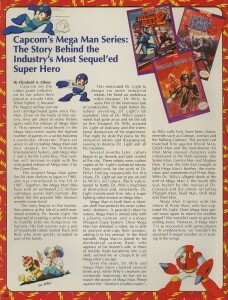 In the franchise’s first decade, the story of Mega Man was a story that changed a little every time it was told. Sometimes new details would arise, others might disappear, and on a few occasions it seemed like the story was completely rewritten. What are the true origins of Mega Man? How was he born? How did he come by his name? And why are there so many different versions? In the early 90s, these were very difficult questions for American fans to answer, and here are some of the reasons why. Today we’ll be looking at a few different gaming magazine articles, each reporting on the original Mega Man story. But first, how about that name thing? 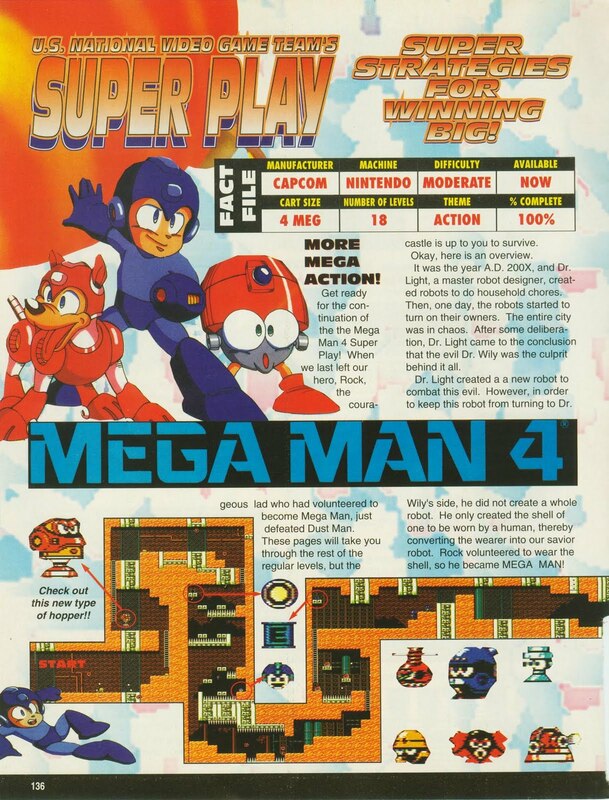 In a leftover page from yesterday, the March 1993 issue of Game Players Nintendo Guide teased what little info they had on the upcoming Super Mega Man game. Which was, not a lot. 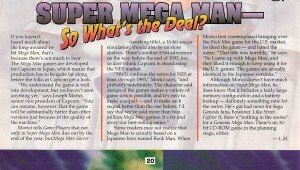 So instead, Capcom USA’s head honcho of the age Joe Morici spilled the beans on some future plans for the series, while recanting the tale of how Mega Man was brought to our shores from abroad. This one is even more informative. And a nice pic of some Rockman merchandise too! Roll was not completely dropped from the games of course, but up to that time she had been ignored by the game manuals, making Roll’s role in the series rather unfamiliar. 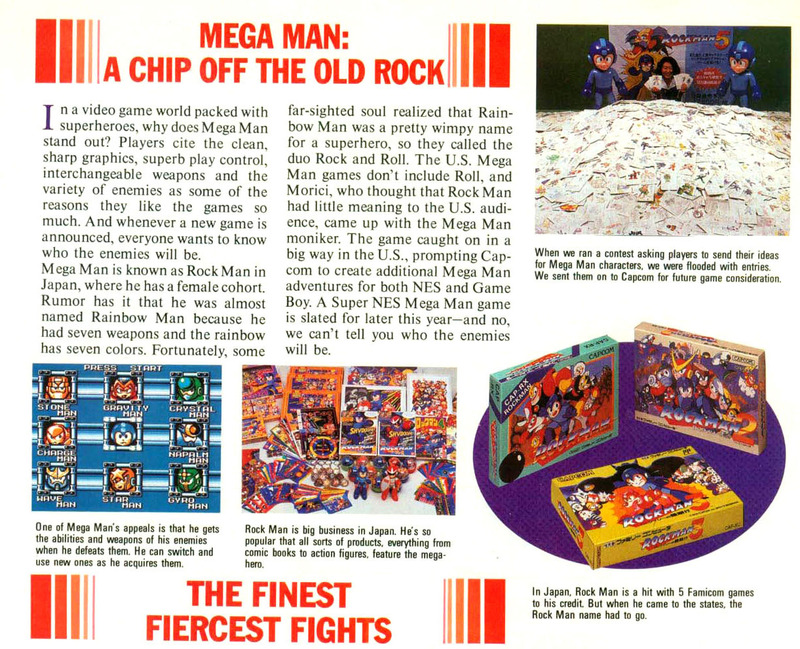 And with all the harping on the importance of changing his name, I have to wonder, did they really consider “Rock Man” to be such a deal breaker? Or were they just being agreeable to the company that was bringing Nintendo mega bucks with their Street Fighter II franchise? Let’s get back to our core question. 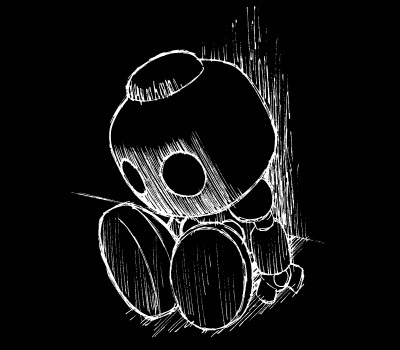 What is the origin story of Mega Man? Here three magazines try to answer the query. First, let’s look at Nintendo Power #42. 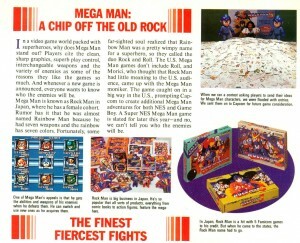 When it comes to understanding the Mega Man story, Nintendo Power relied on the game’s US manual itself. 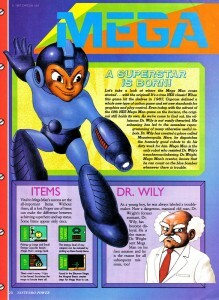 That means using Dr. Wright (even though every Nintendo Power up until that point had used “Light”), and his former assistant turned supervillain Dr. Wily, the dastardly dictator of Monsteropolis. Can’t fault them for wanting to go to the source, even dated as it was by November of 1992 when this review was published. Next up, EGM provides more contemporary (circa 1992) take on the story, based largely (but perhaps not largely enough) on the Mega Man 4 game intro. Ah yes, the tale of the courageous man named Rock who was transformed by Dr. Light into Mega Man, to battle the evil “Dr. Willy.” Wait, man? Don’t they mean robot? Nope. They mean a human wearing a robot “shell.” (Guess they just skimmed over the part of the game’s intro where Rock and Roll were household robots Dr. Light built.) 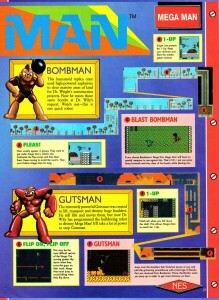 These were play guides EGM published during winter of 1992, the scans were taken from their 1993 Buyers Guide which compiled them into one volume. O~kay! So now we know that Dr. Wright (or Light) built (or turned a human into) a robot (cyborg?) called Mega Man to battle Dr. Willy (or Wily) who might have been the good doctor’s assistant who turned disloyal and built himself an empire, or might just be a mad scientist who stole and reprogrammed some robots to attack a city. Confused yet? Hold on to your shorts, here comes another take! 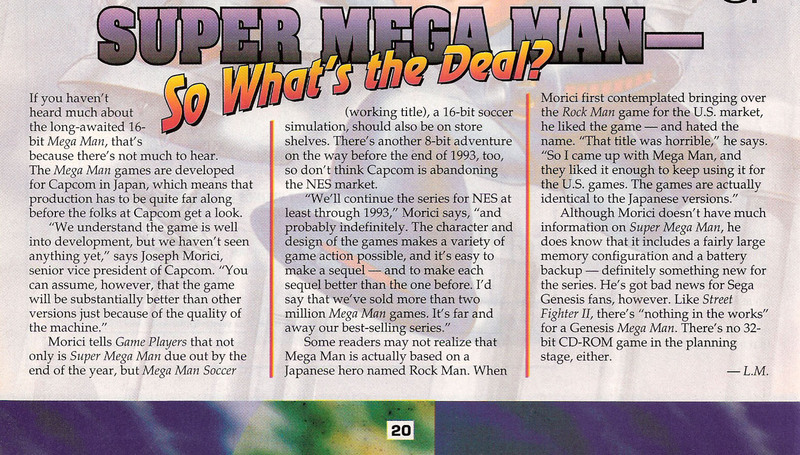 The bimonthly Jan-Feb 1993 issue of Game Informer has its own Mega Man story to tell. Of the ones we’ve looked at so far, it is the most in-depth, and might be viewed as the middle ground between the earlier two stories. Here, Rock and Roll (she finally gets a mention!) are robots after all, built by mild mannered Dr. “Xavier” Light, who then employs an assistant Dr. Wily to help him design 6 industrial robots. The arrangement goes awry when one of Wily’s experiments explodes in their lab, causing Wily to break things off and run. Later, Wily uses some stolen plans to make his own evil versions of Light’s robots, taking over the city. Robot Rock volunteers to become Mega Man, a titanium armored warrior equipped with a plasma cannon and Weapon Copy System. This is probably the most comprehensive thus far, but it isn’t without its own small quirks, such as the lab accident before the robot unveiling, and Dr. Wily building his own copies of the robots rather than reprogramming the ones that Light built. Also, we know of course that Rockman debuted in 1987 in Japan, not 1985, and that eventually Light’s Japanese first name of Thomas would come to replace Capcom USA’s use of Xavier. 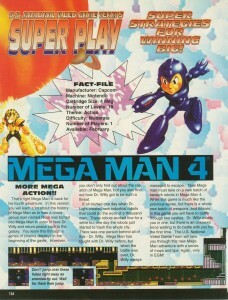 Despite that, this version of the Mega Man story was probably at the forefront of its era, carefully assembling a cohesive story from the bits and pieces that the others had only glanced over. By 1994 it had also garnered some influence over Miranda Paugh, author, webmistress, and creator of one of the first and largest Mega Man sites to ever exist, the Mega Man Home Page. Not bad for one little retromag. Still, with all these variations coming one after another, it’s no wonder there was so much confusion about the very basic details of the plot. But looking back, I can’t help but enjoy every retelling for its own unique take on the Mega Man mythos. Each is charming in its own way, and I hope you’ve enjoyed (re-)reading them as much as I have. If you’d like to read the full reviews and articles from any of the sample images above, they’re all available for free download at Retromags. Isn’t the internet grand? Tomorrow, we’ll have yet another retromags adventure. See you then! 1 Trackback to "Retro Origins"
1 Comment to "Retro Origins"
’tis an older article, and the site hasn’t been updated in a while, but I thought I’d leave a comment anyway. I find it interesting how so many(?) 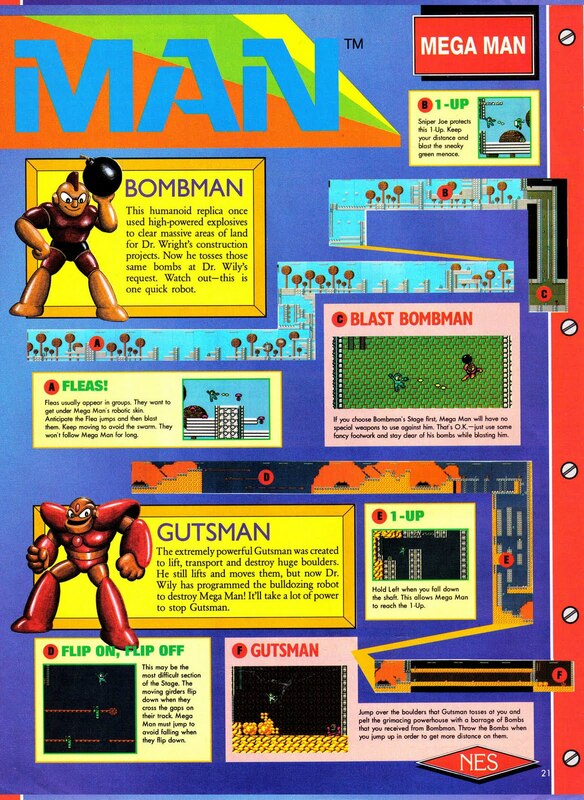 people assumed that Megaman was at least half-human; AFAIK, there isn’t a single alternate continuity (aside from these articles) that suggests that–especially not The Official Guide to Megaman, which I think was the most prominent one (in the US) at the time. 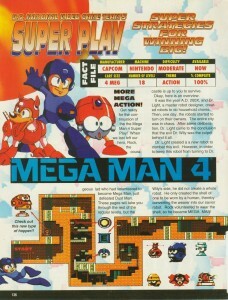 It really goes out of its way to demonstrate how incredibly robotic they thought Megaman was.